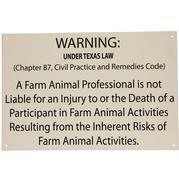 The Texas Equine Liability Sign is an easy-to-read Texas farm animal activity warning sign. Makes your injury liability message clear to visitors and employees. Surface-mount animal safety sign is directly printed in color with a white background.